Art gallery Puerta Roja is not only unique in Hong Kong—it's unique in the whole of Asia. 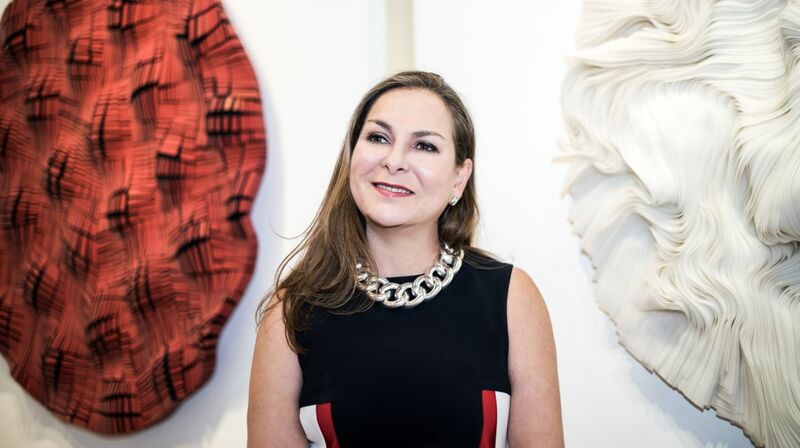 Founded in 2010 by Adriana Alvarez-Nichol, Puerta Roja is the only gallery on the continent that specialises in art from Spain and Latin America, shining a light on part of the world that was previously overlooked by many art lovers. In its Sheung Wan space, Puerta Roja has showcased everything from woven sculptures by Mexican artist Héctor Velázquez to Venezuelan painter Carlos Cruz-Diez's candy-coloured canvases. This commitment to presenting a wide range of works was on show in the gallery's recent exhibition celebrating its eighth anniversary, Reflections, which was co-curated with six other galleries from around the world and featured paintings and sculptures by 12 artists. As that anniversary show comes to a close, Adriana looks to the future and introduces the latest artist to join her gallery: Chilean sensation Fernando Prats. What was the first piece of art that moved you? I remember the first time I was conscious of being in front of an "artwork". I was 12 at the time and visited an exhibition close to our home about surrealism with my sister. At the time, I did not fully grasp its meaning, but the impression on me was instantaneous when I encountered a work by British-Mexican artist Leonora Carrington. I was amazed at her ability to capture what seemed to be a dream world full of fantasy, emotion and hidden messages. She remains one of my favourite artists and I have been honoured to own and exhibit some of her work at Puerta Roja. What was the first exhibition you ever hosted at Puerta Roja? When I founded Puerta Roja, I did a few smaller exhibitions while I developed our vision and stable of artists and learned about the local market. But my first big statement exhibition was in 2011 and was a thirty-year retrospective of Roberto Cortazar, a Mexican icon previously unseen in Asia. We presented more than forty works by the artist, including loaned works—which weren’t for sale—from private collections. The response was phenomenal—it marked our arrival on to the Hong Kong art scene. It must be Digital Paradise by Miguel Chevalier in 2014. Miguel is one of the pioneers of digital art, having worked with computers even before PCs were available. He has done hundreds of public monumental installations around the world. For his first gallery exhibition in Asia, we created a large scale interactive and generative installation of a living garden. As we needed a larger space than my gallery, we rented a pop-up venue for ten days. The daily cost of the venue was so high that we had to push for the installation to happen in only two days—a record for the artist. In terms of programming, we had more than fifteen events, including private dinners, children's workshops, student tours and several talks with the artist in conversation with Aric Chen, William Lim and Hing Chao. It was an absolute marathon and I think I had to sleep for two days in a row afterwards! Which artist do you not currently represent who’d you love to work with and why? As an avid follower of the Op and Kinetic art movement—an obsession I inherited from my father—I would love to represent the work of Jesus Rafael Soto, who died in 2005. Famous for his "penetrable" works, he transformed spaces immersing the viewer into all-encompassing, kinetic installations. Unfortunately for me, Perrotin has represented the artist's estate since his death. So I've had to console myself by exhibiting some outstanding secondary market works from private collections and those of our Parisian partners, Galerie Denise René, who launched Soto's career. I think it’s the vibrancy of an art scene that is developing at a staggering speed. When I arrived in Hong Kong to open Puerta Roja, there were possibly less than twenty galleries in the city. Shortly after, Gagosian and White Cube arrived. Today, there are more than fifty serious international and local galleries presenting some of the best shows in the region and, I would venture to say, in the world. This question is easy: rent! Who is the most recent artist to join your gallery and what excites you about their work? Fernando Prats, who I believe represents Puerta Roja's philosophy by marrying a profound intellectual and conceptual discourse with a very poetic and robust aesthetic. Prats, who represented Chile at the Venice Biennale, creates “natural paintings” by recording fleeting natural actions on smoked surfaces, from the movements of animals to powerful waves and even imprints of geysers shooting water from the ground. What exhibition are you hosting next? Next is a show of Fernando Prats’ nature paintings, presenting his Paintings of Birds series for the first time in Hong Kong. In this work, the artist’s hand gives way to the free and fleeting beating of the bird’s wings, making a rhythmic and majestic imprint on the smoked surface. I am excited as we will host a live performance by Fernando at Asia Society during the Hong Kong Art Gallery Association Symposium. The resulting work will be donated to the fundraising efforts of The Nature Conservancy in Hong Kong. Which exhibitions will you be visiting around the world in the next year? It is tough for me to plan even one year in advance, mainly due to the seasonal nature of the Asian art market and art fair schedule. I do hope to make it to the Venice Biennale as I missed the last one. I think I would have to choose Carlos Cruz-Diez. At 95, the artist continues to work every day with unparalleled energy and positive spirit. Despite his global stature, Cruz-Diez remains a humble, kind soul, constantly searching for intellectual answers while affecting emotionally everyone that meets him. He has also involved his family in his work, developing a vision for his legacy that I think is unique among artists. As for gallerists, I would need to say Denise René, who launched the career of the likes of Vasarely, Soto, Agam and Cruz-Diez himself. So powerful was her influence in post-war art that she was nicknamed the "Pope of Abstraction". I founded Puerta Roja in 2010, two years before Denise René’s passing at the age of 99. This past spring, I was privileged to organise a joint exhibition with Galerie Denise René, which is now led by her nephew, Denis Killian.